An old IRT sign remains at Wall Street station. The first IRT subway ran between City Hall and 145th Street at Broadway, opening on October 27, 1904. It opened following more than twenty years of public debate on the merits of subways versus the existing elevated rail system and on various proposed routes. Founded on May 6, 1902, by August Belmont, Jr., the IRT's mission was to operate New York City's initial underground rapid transit system after Belmont's and John B. McDonald's Rapid Transit Construction Company was awarded the rights to build the railway line in 1900, outbidding Andrew Onderdonk. :20–22 On April 1, 1903, over a year before its first subway line opened, the IRT acquired the pre-existing elevated Manhattan Railway by lease, gaining a monopoly on rapid transit in Manhattan. The Manhattan EL was the operator of four elevated railways in Manhattan with an extension into the Bronx. The IRT coordinated some services between what became its subway and elevated divisions, but all the lines of the former Manhattan EL have since been dismantled. In 1913, as a result of massive expansion in the city, the IRT signed the Dual Contracts with Brooklyn Rapid Transit (BRT) in order to expand the subway. The agreement also locked the subway fare at 5 cents for forty-nine years. The IRT unsuccessfully attempted to raise the fare to seven cents in 1929, in a case that went to the United States Supreme Court. The IRT ceased to function as a privately held company on June 12, 1940, when its properties and operations were acquired by the City of New York. Today, the IRT lines are operated as the A Division of the subway. The remaining lines are underground in Manhattan, except for a short stretch across Harlem at 125th Street and in northernmost Manhattan. Its many lines in the Bronx are predominantly elevated, with some subway, and some railroad-style right-of-way acquired from the defunct New York, Westchester and Boston Railway, which now constitutes the IRT Dyre Avenue Line. Its Brooklyn lines are underground with a single elevated extension that reaches up to New Lots Avenue, and the other reaching Flatbush Avenue via the underground Nostrand Avenue Line. The Flushing Line, its sole line in Queens, is entirely elevated except for a short portion approaching its East River tunnel and its terminal at Flushing–Main Street (the whole Manhattan portion of the line is underground). The Flushing Line has had no track connection to the rest of the IRT since 1942, when service on the Second Avenue El was discontinued. It is connected to the BMT and the rest of the system via the BMT Astoria Line on the upper level of the Queensboro Plaza station. The only line in Queens is the Flushing Line (7 <7> ​ trains), under 50th Avenue, and over Queens Boulevard and Roosevelt Avenue. 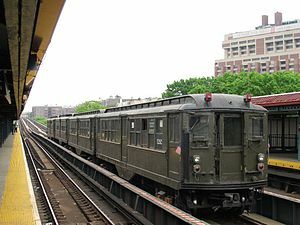 Flushing Line, on October 16, 1949, the joint BMT/IRT service arrangement ended. The Flushing Line became the responsibility of IRT. The Astoria Line had its platforms shaved back for exclusive BMT operation. Broadway–Seventh Avenue Line to new South Ferry island-platformed stations, opened March 16, 2009 and closed temporarily from October 28, 2012 to June 27, 2017 because of Hurricane Sandy. Several pieces of pre-unification IRT equipment have been preserved in various museums. While some of the equipment are operational, others are in need of restoration or are used simply as static displays. Manhattan El revenue collection car G is preserved at the Shore Line Trolley Museum. Manhattan El car 786 was preserved at the Knox & Kane Railroad in Marienville, PA. The fate of this car is unknown after the railroad closed in 2008. IRT elevated motorman instruction car 824 is preserved at the Shore Line Trolley Museum. Richmond Shipyard Railway cars 561 and 563 (ex Manhattan El cars 844 and 889) are preserved at the Western Railway Museum in Rio Vista, California. The private car of August Belmont Jr., numbered 3344 and named the Mineola, is preserved at the Shore Line Trolley Museum. Gibbs car 3352 is preserved at the Seashore Trolley Museum. Deck Roof car 3662 is preserved at the Shore Line Trolley Museum. Lo-V cars 4902, 5290, 5292, 5443, 5466, 5483 and 5600 have been preserved. Cars 4092, 5290, 5292, 5442 and 5483 are preserved by the New York Transit Museum and Railway Preservation Corp. Car 5466 is preserved at the Shore Line Trolley Museum. Car 5600 is preserved at the Trolley Museum of New York. World's Fair Lo-V car 5655 is preserved by the New York Transit Museum. ^ "NYC Minimum Curve Radius". Archived from the original on March 18, 2012. ^ "About New York; Alphabet Soup: Telling an IRT From a BMT". The New York Times. June 30, 1990. Retrieved March 14, 2016. ^ "EXERCISES IN CITY HALL. ; Mayor Declares Subway Open -- Ovations for Parsons and McDonald". The New York Times. October 28, 1904. Retrieved December 16, 2018. ^ "INTERESTING FACTS ABOUT OUR SUBWAY; Chronology of the Great Underground System". The New York Times. October 28, 1904. Retrieved December 16, 2018. ^ Cudahy, Brian J. (1995). Under the Sidewalks of New York: The Story of the Greatest Subway System in the World (2nd revised ed.). New York: Fordham University Press. ISBN 0-8232-1618-7. ^ Derrick, Peter (2001). Tunneling to the Future: The Story of the Great Subway Expansion that Saved New York. New York: New York University Press. pp. 2–3. ISBN 0-8147-1910-4. ^ "SUBWAY CONTRACTS SOLEMNLY SIGNED; Cheers at the Ceremonial Function When McCall Gets Willcox to Attest" (PDF). The New York Times. March 20, 1913. ISSN 0362-4331. Retrieved January 11, 2018. ^ Gilchrist v. Interborough Rapid Transit Co. , 279 U.S. 159 (1929). ^ "CITY TRANSIT UNITY IS NOW A REALITY; Title to I.R.T. Lines Passes to Municipality, Ending 19-Year Campaign OPERATION CHANGE MADE Network of Subway, Surface Car and Bus Routes a $1,500,000,000 Investment". The New York Times. June 13, 1940. Retrieved December 16, 2018. This page was last edited on 3 January 2019, at 00:06 (UTC).